Lighthouse - Winter IslandSalem, MA / October 12, 2009 -- We arrived Saturday night so we could get Joe to Logan Airport early Sunday morning for his trip to Mobile, Alabama. Because the park was full when we changed our arrival date, they put us in overflow parking (no hookups). They have a gate which closes at 10PM and opens at 7AM. We had to leave to the airport by 6:30AM, so had to park the Jeep about a half mile away outside the gate and walk back and forth. It all worked out okay. He gets home at midnight tomorrow (Wednesday) so we have to do the drill all over again. This is a very historic area and is really cool to be here. It is right next to Fort Pickering which has been here since the 1600's and was used during the Revolutionary War. The lighthouse was decommisioned several years ago, but is still neat to see and really enhances the view out to sea. It's cold this time of year, currently 40 degrees. It was cold, rainy and windy all day today. We are headed south to Florida where we know warmth awaits, so I'm enjoying the contrast a lot. We were supposed to drive to our location in New York City (RV park is in Jersey City) this weekend, but they are booked until next Thursday, so we have to find a place somewhere in Connecticut or upstate New York next week. The parks are closing, so it's getting tricky. With no neighbors, the view is amazing, looking out to see the entrance to Salem Harbor and the Atlantic Ocean beyond. I try to imagine what it looked like 200 years ago when the old sailing ships and military frigates would be entering and exiting the harbor. 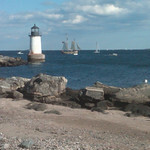 From what I've been told, Salem harbor was the principal harbor on the New England coast, before Boston harbor took over that status.